Laurent Cantet’s Time Out is an intense look at one man’s professional angst and its rollover effects, a terrifying study of bourgeois desperation worthy of Claude Chabrol. Vincent (Aurélien Recoing) loses his job and, rather than tell his relatives, invents a new one. He studies a company’s media kits and manages to convince friends and family to invest in his fantasy corporation. Vincent’s journey is an affront to the dehumanization of economic slavery. By lying to himself and the world around him and freeing himself from responsibility, he achieves the kind of freedom where the only person he has to answer to is himself. Though clearly in turmoil, Vincent seems to take a kind of silent pleasure in his deceit. 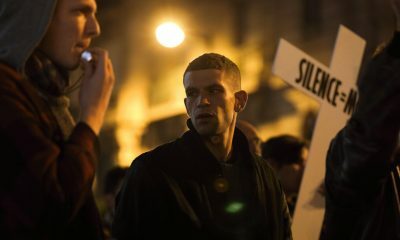 Like Dirk Bogarde’s delusional protagonist in Fassbinder’s Despair, the oppressed Vincent may be deranged if only because it appears as if he’s really convinced of the authenticity of his fabricated existenz. Most fascinating, though, is the way Vincent’s wife Muriel (Karin Viard) becomes an unwitting participant in the lie she believes is destroying their lives. Cantet implies that Vincent is noble at heart by chooseing a job where he gets to live the illusion of helping all of humanity: The man comes to imagine that he works for the United Nations. Cantet’s snowy landscapes compliment Vincent’s human disconnection. An abandoned cottage by the Swiss Alps is the man’s makeshift office and the snowy trek to the cottage comes to symbolize a nervous wire-walk between stringent societal demands and personal freedom. Joceyln Pook’s operatic score matches Cantet’s unflagging gaze (the film’s compositions are as rigorous as the judgment Vincent receives from his peers). As a bona fide thriller, though, Time Out is all tease; the film’s many ruses and ominous tonality is patently misleading. (Interestingly, the film is based on a true story with a not-so-happy ending.) Though partially compromised by its horror façade, Time Out is a riveting account of a curious, self-made man, a lone warrior carving out a personal niche for himself in an otherwise onerous landscape.